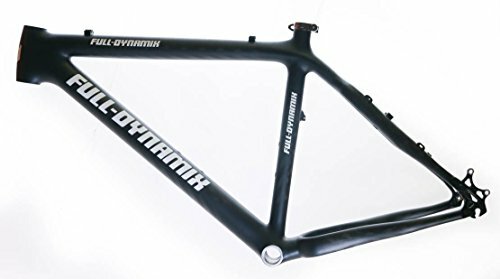 FULL DYNAMIX CARBON MTB BIKE FRAME MSRP $1999.99 NEW / SHIPS IN 24HRS SPECIFICATIONS: Manufacturer: Full Dynamix Model: Moon Frame material: Carbon Fiber Wheel compatibility: 26", Quick release x 135mm Brake compatibility: Disc or Rim Brake Fork compatibility: 1-1/8" straight only Seat post compatibility: 31.6mm Front derailleur compatibility: 34.9mm, top pull only Bottom bracket shell: 68mm English threaded (BSA) Includes frame, seatpost clamp, and headset Mass: 1360 grams Condition: New GEOMETRY: Top Tube: 23.0" (actual, center of headtube to center of seat tube) Seat Tube: 21" (Center of BB to top of seat tube) Head Tube: 6.1" NOTE: Images taken from 19" version. If you have any questions about this product by Full Dynamix, contact us by completing and submitting the form below. If you are looking for a specif part number, please include it with your message.